Police officers with their guns drawn hear the second explosion down the street, April 15, 2013. Photo credit: John Tlumacki / The Boston Globe / Getty Images. 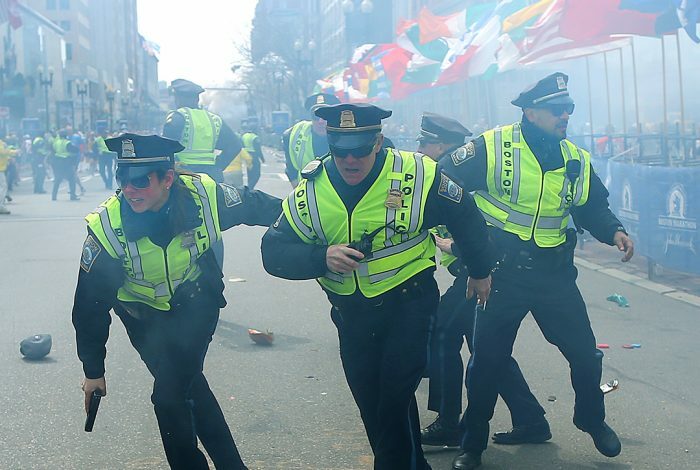 The US government’s latest report on the Boston Marathon bombing is so full of revealing information buried in plain sight, it seems as if an insider is imploring someone—anyone—to dig deeper. It reads like the work of an unhappy participant in a cover-up. • A Boston FBI agent seemingly recruiting and acting as Tamerlan Tsarnaev’s control officer, interacting personally with him, preventing on multiple occasions serious investigations of Tsarnaev’s activities, and then pleading ignorance to investigators in the most ludicrously improbable manner. • The likelihood that the blame game between the US and Russia over who knew what, and when, regarding Tamerlan Tsarnaev and his activities, masks a deeper geopolitical game which may very well point to the sine qua non of most such struggles—the battle for the control of precious natural resources. 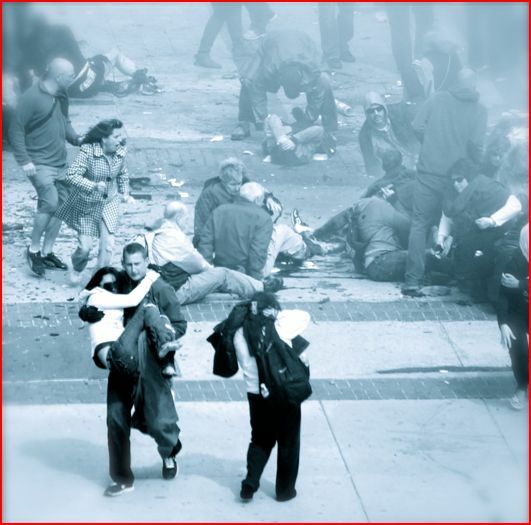 • The sheer inability of well-meaning US government officials—who either may know or suspect that the “official” account of the Boston bombing, with the Tsarnaev brothers as lone wolf terrorists, is utterly false—to come out and state their true beliefs. The most recent report is an example of the necessity of reading between the lines. The other day, we explained a key point missing from most coverage of the Boston Bombing story: that the US government may have been in contact with the alleged bombers before the Russians ever warned about them. Since then, the report itself has been released. It is the coordinated product of probes by Inspectors General from a number of intelligence agencies and other governmental entities. Actually, what’s been released is not the report itself—just an unclassified summary filled with redactions. Even so, it is enormously revealing, as much for what it does not say as for what it does. Be advised that this is not a short read. Our take is an in-depth look at how the government loads the dice for its own purposes. As such, it is necessarily complicated, with layers of obfuscation that need to be peeled away. But if you want to get some inkling of what might actually lie behind the Boston Marathon Bombing, read on. Let’s start by taking a look at the summary report. In March 2011, the FBI received information from the FSB alleging that Tamerlan Tsarnaev and Zubeidat Tsarnaeva were adherents of radical Islam and that Tamerlan Tsarnaev was preparing to travel to Russia to join unspecified underground groups in Dagestan and Chechnya. The FBI-led Joint Terrorism Task Force in Boston (Boston JTTF) conducted an assessment of Tamerlan Tsarnaev to determine whether he posed a threat to national security and closed the assessment three months later having found no link or “nexus” to terrorism. So, in March 2011, the FBI received information from the FSB (Russian internal security service, comparable to the FBI), warning about terrorist threats posed by the Tsarnaev family. We have long been told that this Russian warning was the first time the Tsarnaevs were on the US government’s radar. After that paragraph comes a sub-section labeled JANUARY 2011 COMMUNICATIONS. The entirety of that section, including a lengthy footnote, has been redacted. Reading a government report with redactions is like reading tea leaves in the bottom of a dirty cup. You can’t know for sure what’s been suppressed, but you can hazard some educated guesses about why certain material was deemed too dangerous for the public to know. In this case, you have to ask: Why would the first item in Section V and the entire subsection labeled “January 2011 Communications” be suppressed. The answer may lie in a story that appeared in the New York Times last week. Based on a leak exclusive to the Times, the story quoted a “senior government official” who claimed that the Russians had withheld some key information when it informed the US about the Tsarnaevs’ jihadist leanings in March 2011—information that might have made the US government pay more attention to the Tsarnaevs, and so perhaps could have helped avert the Marathon bombing. As we previously noted, much earlier, back in 2013, the New York Times reported another leak. That leak asserted that US authorities had been in contact with the Tsarnaevs as early as January 2011. If true, this assertion would be enormously consequential, because it would mean the Tsarnaevs were known to US authorities two months before American intelligence learned from the Russians that the Tsarnaevs might be terrorists. As far as we know, no one in the media ever followed up on this leaked assertion. When we queried the Times about it, the paper never replied. Nor has the Times ever published a correction. Now, it is possible that the official who provided the Times with that earlier leak was mistaken, or that the Times got the date or the facts wrong and did not want to admit its error in public. But it’s hard not to see a link between that leaked assertion and the government’s redaction, in the just released summary, of the entire section labeled January 2011 Communications. What is in that section that’s so disturbing to the censors in the American intelligence community? One possibility is that the US censors are not so concerned about the information in those “communications” as in the way that information was obtained. Russia Eavesdropping on American Telephone Conversations? It would of course be news if the Russians were capturing domestic American telephone conversations, and if they were so interested in the Tsarnaevs that they launched a very risky and complicated operation to eavesdrop on that family’s communications within US borders. This real possibility can be further contextualized. The Boston area has long been a hotbed for spy-vs-spy intrigue. With top military research going on at Cambridge-based MIT and other area institutions, that’s not surprising. Consider that the Tsarnaevs lived in Cambridge—home to members of a ring of Russian spies that was broken up shortly before the Tsarnaevs came under scrutiny. Remember that the US rolled up a spy ring in June of 2010—after monitoring it for a decade, and that an exchange of prisoners quickly followed. An American mole inside Russian foreign intelligence, Col. Alexander Poteyev, who was back-channeling to American intelligence while simultaneously directing the stateside ring from Russia, fled to the US before the arrests. His role was obscured by American officials; and his identity was only revealed when a Russian court later found him guilty in absentia. Few Americans remember Poteyev’s role, or any of the other more remarkable “details.” Indeed, US media coverage of the Russian spy ring story quickly focused on the sexiness of one of the characters, Anna Chapman, who returned to Russia as part of the exchange and became a lingerie model, corporate spokesperson, and national icon. However, US officials dismissed the ring itself as a “sleeper cell” that actually accomplished nothing.We wonder if this is true. Did the Russians really go to such enormous efforts over a decade and achieve nothing substantive? More on this in a moment, but for now, consider the notion of an active Russian spy ring in the Tsarnaevs’ Massachusetts backyard as a basis for further thinking. Given the “shocking” exposure of the Russian ring, it is equally shocking to contemplate that, less than a year later, the Russians have gone from spying to “helping” the US—by notifying American intelligence of potential terrorists in our midst. Either that, or the Russians were notifying the US out of self-interest, to ensure that yet another anti-Russian terrorist did not succeed in jihad on Russia’s turf. To us, frankly, neither explanation is wholly satisfying. It seems there is more going on. Was the US itself monitoring the Tsarnaevs at the same time the Russians were? Of even more interest, did US authorities, as Dzhokhar Tsarnaev’s defense suggests, seek to turn Tamerlan Tsarnaev into an asset? 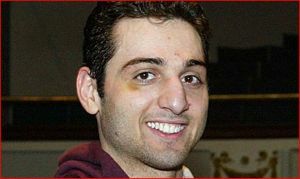 The defense’s claim that the FBI tried—but failed—to get Tamerlan to work for the US is hard to accept, not because the FBI doesn’t regularly try to recruit immigrants like the Tsarnaevs through a carrot-and/or-stick approach, but because it’s hard to imagine the FBI failing in such an endeavor. The “failure” part of the defense claim seems like a concession to the likelihood that detailed information about FBI recruitment would not be admissible in such a case. Also, Dzhokhar Tsarnaev’s lead federal public defender is accomplished at getting her clients charges reduced—in this case, presumably to avoid the death penalty—not at exposing giant falsehoods perpetrated by her government. For context on whether or not Tamerlan Tsarnaev may have agreed to cooperate, consider the FBI’s tactics with people from the Tsarnaevs’ extended circle who did not cooperate, as reported in this earlier piece we did. 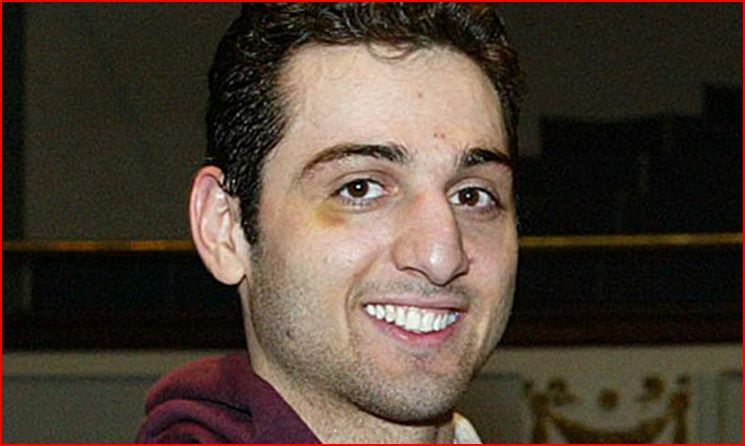 The FBI-led Joint Terrorism Task Force in Boston (Boston JTTF) conducted an assessment of Tamerlan Tsarnaev to determine whether he posed a threat to national security and closed the assessment three months later having found no link or “nexus” to terrorism. Surely if he were working for the US and involved with anti-Russian activities, he would rightfully be found to “have no link to…terrorism”—inasmuch as terrorism (so far as the FBI is concerned) would likely be defined as a threat only to US national security. Also, as the report summary notes, the Russians repeatedly pinged the Americans, presumably because they saw no serious action taking place. They provided information to the FBI in March 2011, and similar material to the CIA in September. 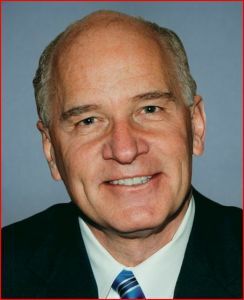 (The report states flatly, and without emphasis, that the FBI had failed to share intelligence with the CIA—a suspiciously common practice that dates back to the John F. Kennedy assassination if not earlier). Did the Russians decide that FBI inaction meant the Bureau had recruited Tamerlan, and either had not notified the CIA or had not done so through official channels? In October, in any case, the CIA passed the Russian intelligence along to a range of agencies, including the Department of Homeland Security and the State Department. It also passed it along to the FBI, as if it did not know that the FBI itself already had the information from half a year earlier. Finally, the information was passed on to the National Counterterrorism Center, which put Tamerlan Tsarnaev on a terrorist watch list. Incredibly, even after this, when Tamerlan traveled to Russia three months later, exactly as the Russians said he would, and while on that terror watch list, US authorities did nothing. This lead information was investigated by the FBI through the Boston JTTF. Representatives from the DHS, CIA, and other federal, state, and local agencies work directly with FBI-led JTTFs across the country, including in Boston. Notice the waffling. The summary authors state a standard principle: FBI-led investigation units “work directly” with other federal and local agencies. They explicitly do not say that the FBI did so in this case. And how could they? Because the FBI clearly did not. Mind you, this is WhoWhatWhy’s attempt at coherently and accurately summing up the content of the Summary Report. It is instructive that those who prepared the report did not feel the need to emphasize these rather glaring and seemingly deliberate “failures”—and instead basically give the FBI and US government a free pass for their cover-up. Keating said the letter gave Tsarnaev’s date of birth, his cellphone number, information about his boxing career, weight and Golden Gloves matches. It talked about his wife and mother, giving the mother’s Skype number. The up-close look at Tsarnaev’s life raised questions, which went unanswered, about how the FSB had accumulated so much information about a family in Boston. 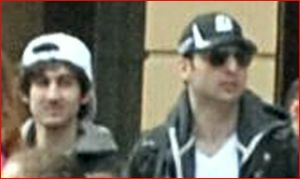 The Russian authorities provided personal information about both Tamerlan Tsarnaev and Zubeidat Tsarnaeva, including their telephone numbers and e-mail addresses, and requested that the FBI provide the FSB with specific information about them, including possible travel by Tsarnaev to Russia. Importantly, the memorandum included two incorrect dates of birth (October 21, 1987 or 1988) for Tamerlan Tsarnaev, and the English translation used by the FBI transliterated their last names as Tsarnayev and Tsarnayeva, respectively. Only later do we read that an FBI agent had no difficulty resolving these issues. So they began their inquiries with two predispositions: (1) that the government had very little information available on its own, and (2) that completely contrary to Edward Snowden’s revelations about NSA abuses, US agencies are scrupulously careful about how they collect private data on individuals. [T]he OIGs were mindful of the sensitive nature of the ongoing criminal investigations and prosecutions related to the bombings, and were careful to ensure that the review would not interfere with these activities. 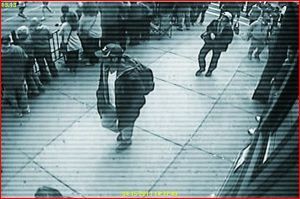 We carefully tailored our requests for information and interviews to focus on information available before the bombings and, where appropriate, coordinated with the U.S. Attorney’s Office conducting the prosecution of alleged bomber Dzhokhar Tsarnaev. Presumably, a truly independent investigation would involve coordinating with anyone who had information to impart, including Dzhokhar’s defense. In this section, we summarize the chronology of events relating to the U.S. government’s knowledge of and interactions with Tamerlan Tsarnaev, members of his family, and other associates before the bombings. Many of the activities and events that occurred during the period discussed below cannot be included in this unclassified summary. Redactions in this document are the result of classification and sensitivity designations we received from agencies and departments that provided information to the OIGs for this review. As to several of these classification and sensitivity designations, the OIGs disagreed with the bases asserted. We are requesting that the relevant entities reconsider those designations so that we can unredact those portions and make this information available to the public. conducted database searches, reviewed references to Tsarnaev and his family in closed FBI counterterrorism cases, performed “drive-bys” of Tsarnaev’s residence, made an on-site visit to his former college, and interviewed Tsarnaev and his parents. The question is obvious: Why no effort to monitor the Tsarnaevs’ covertly? What about, instead of warning them that they were under suspicion, keeping a close and quiet watch on them? Isn’t that how you would proceed if you wanted to find out what a suspected terrorist was up to? Instead of raising this point, the OIG summary questions why the FBI did not make even more noise, including interviewing others who knew the family. Then it notes the FBI agent’s failure to query every database, but points out that such an additional effort would not likely have garnered much new information. And while acknowledging that the FBI failed to share information with other agencies, it gives the Bureau an out by lamely saying that if other agencies had known where to look it a shared database, they might have happened upon the information. And if it’s Tuesday, this must be Belgium. The rest of this paragraph is blacked out. In fact, that’s the first redaction you come to in the whole report. For some reason, the OIGs do not make more of this—though it demonstrates that the FBI counterterrorism officer failed to ask the questions that mattered most. It is not hard to see how introducing a plethora of such small obfuscations into a “Summary Report” can keep even expert readers from focusing on the larger issues in play. And when the readers are less-than-expert representatives of the mass media, the tactic is even more effective. A review of articles about the report in major newspapers makes this abundantly clear. The report concludes that a Customs and Border Patrol officer most likely notified the FBI when Tamerlan Tsarnaev traveled to Russia in 2012. The Customs officer also flagged Tamerlan so his record would be visible for his own colleagues when Tsarnaev re-entered the country. This kind of inconsistency makes it all but impossible to get to the bottom of things, and the IGs don’t seem to have tried hard. Everything about this case suggests that we might want to learn more about the Boston FBI agent and his most unusual behavior. Was he wildly incompetent and reckless, or operating under some kind of instructions? Unfortunately, the names of such significant personnel are almost never made public. A US Citizenship and Immigration Services officer says he actually met with the FBI agent and told him that Tsarnaev was on track to be granted citizenship. Despite all that he knew, the FBI agent apparently had no objection. Based on all the information gathered during our coordinated review, we believe that the FBI, CIA, DHS and NCTC generally shared information and followed procedures appropriately. We identified a few areas where broader information sharing between agencies may have been required…. In light of our findings and conclusions summarized above, the participating OIGs found no basis to make broad recommendations for changes in information handling or sharing. We nonetheless identified some areas in which existing policies or practices could be clarified or improved. When your instincts tell you that a major effort is underway to make sure no one gets to the bottom of things, you’re inclined to look for larger explanations. To wit: Could some kind of larger geo-strategic battle relate to the Boston bombings, with the on-the-ground players mere pawns? We’ll have more to say later about the larger circle of national-security-community figures that has surrounded Tamerlan and Dzhokhar Tsarnaev for years. But for now, we want to step back a little. Given the tendency of spy services to play elaborate games with a long view, it is reasonable to wonder whether the Russians had more in mind than just being helpful when they notified the US that it ought to look at the Tsarnaevs. Could the notice to the FBI have been a warning that the Russians knew the US was already in contact with the Tsarnaevs? Given the possibility that Tamerlan Tsarnaev was supposed to infiltrate anti-Russian jihadists, that essentially puts the two intelligence services on the same side in this matter. Or were the Russians worried that the Americans were playing a double game, seemingly hunting jihadists while simultaneously using those jihadists to put pressure on the Russians in their majority-Muslim, oil-bearing southern flank? There is also the possibility that, as with the US mole in Russian intelligence, Colonel Potayev, both sides thought they were controlling the Tsarnaevs. This would have made them players in a still more dazzling game. Pull out your old spy novels for this one. Consider, as one must, what would be worth such extraordinary measures? What would justify so many redactions in a Summary Report? What would compel a bunch of Inspectors General, purportedly responsible for getting to the bottom of things, to participate in a whitewash? What else but an issue of “national security”? And since, as we know, there were no actual terrorist attacks or credible near-attacks on US soil between 9/11 and the Marathon bombings more than a decade later, these “national security” concerns might logically relate to something else. We hate to sound like a broken record, but keeping the lights and computers on and the cars moving pretty well approximates national security these days. And we all know what powers the grid—and where the next big oil and gas hub is after the Middle East deposits are tapped out. It’s the Caucasus region, the southern portion of the old Soviet Union, which encompasses a bunch of places where the US and Russia have been duking it out in recent years, including notably, Georgia, South Ossetia, Abkhazia, Dagestan and Chechnya. The first three of these are loci of military operations which saw the US and Russia on opposite sides, and the last two are restive, heavy-Muslim-majority Russian Republics with which the Tsarnaevs are associated. • 2001, when, according to former NATO Commander Gen. Wesley Clark, he was shown a Top Secret memo laying out seven countries the US was prepared to invade with 9/11 as the justification. In an exclusive video interview with WhoWhatWhy, Gen. Clark expanded on that, emphasizing the role oil plays in US military policy. It will take a lot more research to determine whether the story neither government is likely to tell is really about a titanic struggle for the earth’s wealth. But, given historical precedents, it would not be so far-fetched. Indeed, it is only the official story of the Boston Marathon bombing which sounds far-fetched. There are 71 comments Our Comment Policy: Keep it civilized, keep it relevant, keep it clear, keep it short. Please do not post links or promotional material. We reserve the right to edit and to delete comments where necessary.